Skateboard History started sometime in the 1950’s. There were several booms and busts since then. Each boom was lead by an increase in the quality of the skateboards. 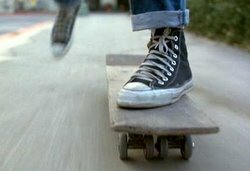 Then in the 90's powered by the innovative ways people started using skateboards, they stuck around. Finally the technology and the skills in skateboarding came together to create a growing and very interesting sport called Skateboarding. There are some great books on the history of skateboarding and I will recommend them sooner or later. Here is my rendition of how skateboarding got to where it is today. There was a strong link to the surfing community. As the excellent documentary Dogtown and the Z-Boys showed. The surfers where looking for stuff to do when the waves were dead. So they put wheels on their boards. It the early 60’s the first companies in skateboard history started making skateboards and there was a boom. It was sort of like the hula hoop. Fun and cool. That fad didn’t last. The metal and clay wheels didn’t give you much control and people got bored of the relatively few things you could do with these skateboards. In 1972 the polyurethane wheel was invented. These grippy and durable wheels allowed for a lot of control and higher speeds than in early skateboard history. 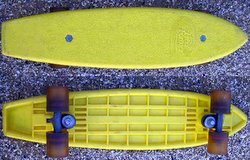 The banana board seen here with urethane wheels lead to another boom for skateboarding. From this boom came important innovations in what people were doing on skateboard. the board got wider so you could go faster and have more control. This let you do even more "tricks" with your board. These innovations are the real reason skateboarding grew. In 1977 the olliewas invented. Doing an ollie allowed you to leave the ground on a skateboard without grabbing and using your hands. The ollie is the most important move in skateboarding. Concrete skateparks started popping up for people to skate at. Big bowls and rolling hills of concrete called snake runs where built. This boom ended due to rising insurance costs at skateparks. The parks had to close and shortly after skateboard slowed again. Early in the 80’s a freestyle skater named Rodney Mullen changed skateboard history when he adapted the ollie to flatland. This allows you to jump your skateboard over things with only your feet. He also invented a lot of other variations involving flipping and spinning the board with an ollie. It was his innovation coupled with the invention of the skateboard video that gave skateboarding that spark to go from a fun fad to a sport. The skateboard company Powell-Peralta produced some of the first skateboard movies. They showed their pros doing all the amazing tricks on tape. this brought skateboarding to places it could have rarely been before. Now you could see the best in the world skateboarding in your own home. Skate videos showed you what the best of the best were doing. By watching them you could have your mind blown. I learned how to skate watching videos. In slow motion they show you how to do what the pros are doing. And what do you do just after you have seen the most amazing never before thought of tricks? 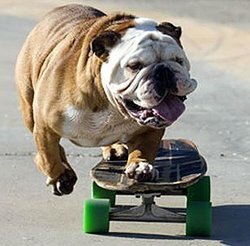 you get really excited and going skateboarding! You learn the tricks for yourself. This started a culture of skateboarding innovation everywhere.These advances created an underground core of skaters that made skateboarding a way of life. The inevitable end of the 1980’s boom came. The underground remained and they were dedicated to the diverse activity of skateboard that they loved. This core group kept on through the downturn. They innovated more and became really stylish with their skating. The sport had matured to the point that it was ready to grow steadily, and it did. Dedicated skaters kept their companies going and even started new companies. The growth of style was evident in the amazing look of the skating and in the fashion of the skaters. The cream of skateboarding style rose to the top. Skaters got way better and skateboards became refined in design. they were much smaller and lighter. They also became symmetrical. Having a nose and tail with a kick allowed for more trick variations. The skaters got way better at skating the streets. The fashion of skaters also took off in the non skater world. Baggy pants and fat shoes caught on. ESPN created the X-Games and exposure went mainstream again. Large contests like these were done well enough to expose a new generation to skateboarding. These changes happen slowly through the 90’s. Giving growth rather than boom. The video game Tony Hawk Pro Skater came out in 1999. It was an instant hit. 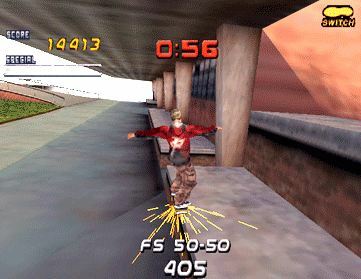 It changed the gaming industry and gave even more exposure to skateboarding. By now there were enough skaters of all ages that they needed good public places to go. Growth continued and the skatepark industry became real. Real skateparks gave more fuel to this industry. The parks are being even more and more refined and producing better and better skaters. Tricks will get bigger and more complex and skateboarding will continue upward.